Why Isn’t The Invisible Hand Training Enough Skilled Workers? The Invisible Hand Is NOT Training Enough Skilled Machinists. Estimates of as many as 600,000 unfilled skilled manufacturing jobs despite years of unemployment over 8% just don’t compute. As a free market guy, I continue to be frustrated waiting for Adam Smith’s Invisble Hand to bring the trained workers our industry needs. Have we done enough to pursue our own interest, so that society too can benefit? Why isn’t the Invisible Hand working? Has it been handcuffed by school bureaucrats who insist that college is for everyone? And parents who fail to critically think about the ROI and Debt obligations that a college degree means today? Has the invisible hand been amputated by school board and advisory council members who think that the trades is just a necessary evil for someone else’s troublemaker of a kid? Do we have a need for public private partnerships like Right Skills Now to elevate the need for skilled tradesmen and to show advanced manufacturing as a viable, well paying career? Why is the US only in the 17th in Science or 25th in Math achievement worldwide? Or have we as shop owners and machinists been missing in guiding that invisible hand by concentrating on everything else except skilled workforce development? What are you doing to develop the skilled workforce that you need? Or are you waiting, like most shop owners over the last decade or so have waited, for someone else to train your crew? 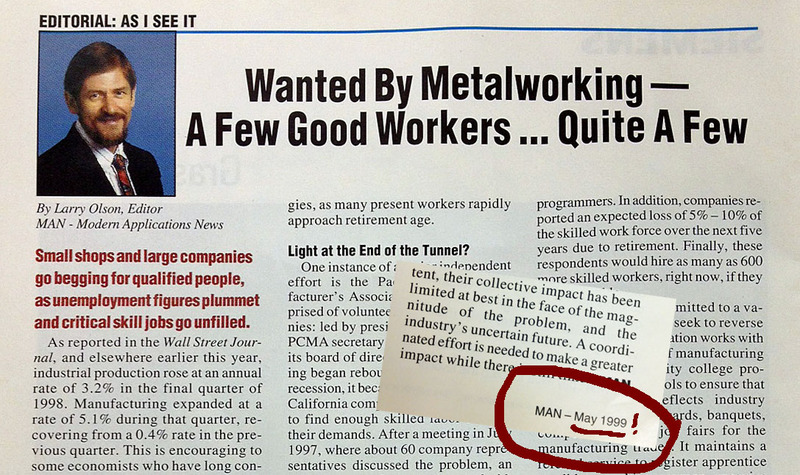 A Few Good Workers originally published in Modern Applications News May 1999. This entry was posted on Tuesday, October 9th, 2012 at 4:19 am and is filed under Front Office. You can follow any responses to this entry through the RSS 2.0 feed. You can leave a response, or trackback from your own site. 2 Responses to Why Isn’t The Invisible Hand Training Enough Skilled Workers?